Nest managed to do the seemingly impossible with its Protect: it made a smoke detector... exciting. But what lurks within that beautiful shell? 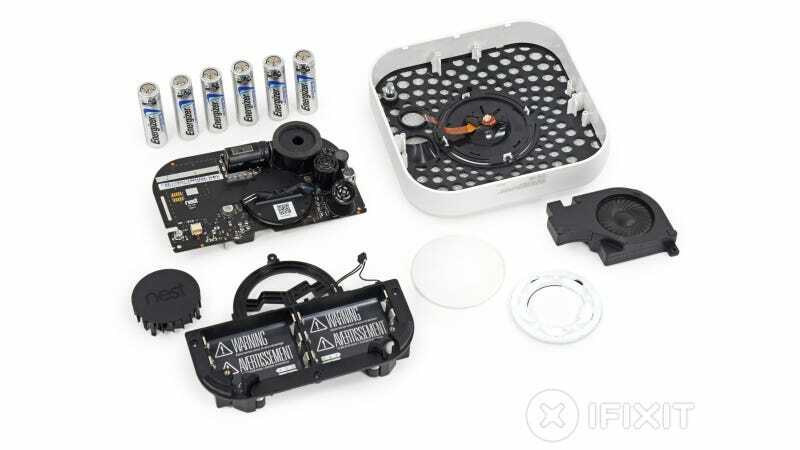 Fortunately, iFixit has ripped one wide open to find out. A pretty crazy-advanced (for a smoke detector) main board, containing the embedded optical detector which uses LEDs to sense smoke. Then there's a CO sensor, which works a little like a fuel cell: carbon monoxide drives a chemical reaction that generates current proportional to the CO concentration in the air. An an 85 dB horn—should be loud enough to raise the alarm. There's also a straight and angled motion sensor, which will catch your waving arms when you want to silence a false alarm. See, waving at the thing can work!